Visitors to the National Air and Space Museum's Steven F. Udvar-Hazy Center admire the Monocoupe 110 Special Little Butch and other aircraft hanging from 10-story-high trusses. Panoramic view inside the Monocoupe 110 Special Little Butch. Air show pilot and aerobatic champion W. W. "Woody" Edmondson thrilled audiences with his Monocoupe 110 Special throughout the 1940s. Edmondson, who named the airplane Little Butch for its bulldog-like appearance, placed second to "Bevo" Howard and his Bücker Jungmeister in the 1946 and '47 American Aerobatic Championships, but he won the first International Aerobatic Championship in 1948. The Monocoupe 110 Special was a clipped-wing version of the 110, part of a line that began with Don Luscombe's Mono 22 and continued with the 70, 90, and 110 models. The sport coupes of the 1930s, these fast and maneuverable aircraft were ideal for racers Phoebe Omlie and Johnny Livingston. Ken Hyde of Warrenton, Virginia, restored Little Butch prior to its donation to the Smithsonian. Woody Edmondson, airshow pilot and aerobatic champion, thrilled airshow crowds with his Monocoupe 110 Special Little Butch throughout the late 1940s. The Monocoupe 110 Special was a special design built for racing and aerobatics from the basic Monocoupe of the 20s and 30s, the airborne sport coupe of the era. The original Monocoupe design came from Luscombe's desire to build an enclosed two-place aircraft for business or person use, something lighter and more comfortable than open-cockpit biplanes. Luscombe was somewhat influenced by the Belgian Delmonty-Poncelet Limousine, a high-wing monoplane with a side-by-side enclosed cabin and the reverse curve rear fuselage lines that were to become one of the signature identifier features of the Monocoupes. Luscombe founded Central States Aero Company and hired Clayton Folkerts, a young self-taught designer. In 1928, the Mono 22 was the first light aircraft awarded an Aircraft Type Certificate (number 22) and in 1930 it was fitted with a Velie M-5 engine to become the Model 70. Central States Aero Company became Mono Aircraft, Inc., of Moline, Illinois, a subsidiary of the Velie Motors Company, and the Model 113 and the Model 90 followed. The Model 110 was basically a Model 90 with a 110 hp Warner Scarab radial engine. The Model 110 Special, a clipped-wing version of the 110, grew out of racing pilot Johnny Livingston's desire to have a faster aircraft for the National Air Races. In 1931 his 110 was streamlined with fairings and wheel pants, and in 1932 Livingston asked Monocoupe to shorten the wingspan from the standard 32 feet to 20 feet, reduce the size and shape of the tail, and install a larger 145 hp Warner Scarab engine. The factory shortened the wingspan to just over 23 feet, retaining sufficient wing area to sustain safe flight during high-speed pylon turns. The changes improved the speed from 150 mph to 220 mph. Over several years, a total of ten Specials emerged, seven were built or modified by the factory, and three were modified by homebuilders. The Monocoupe 110 Special Little Butch, N36Y, was built at the factory in Melbourne, Florida, and test flown on February 3, 1941, by then-Monocoupe president Clare Bunch (Don Luscombe had left the company in 1933). The original base color of the airplane was Monocoupe Blue with an ivory trim. W. J. Coddington bought the aircraft on March 5, 1941, but severely damaged the airplane in a landing accident and returned it to the factory for repairs and resale. Guy Gully of Farrell, Pennsylvania, bought the aircraft on November 16, 1941, but had an accident and sold it to J. D. Reed of Houston, Texas, on August 3, 1943. Reed sold it on March 16, 1944 to W.W. "Woody" Edmondson of Lynchburg, Virginia, who named it Little Butch because of its bulldog-like appearance. Edmondson initially used the airplane for transportation between airports in Virginia and North Carolina where he operated government-sponsored pilot flight training programs during the war. In 1946 he re-entered the airshow circuit and installed a Warner 185 hp Super Scarab. This engine had a pressure carburetor for inverted flying and had a Koppers Aeromatic controllable pitch propeller. He often flew two or three air shows a day all scheduled close to Lynchburg so that he could fly, in his business suit, from one to another. One day Edmondson severely tested the structural integrity of the airplane by making a high-speed inverted pass and pulling up into a series of vertical rolls. This maneuver always subjected the aircraft to severe negative "g" loading conditions for which the airplane was not originally designed. It went into a series of uncontrollable snap rolls and ended up inverted at about 2,000 feet. Edmondson recovered control but then noticed that the right wing struts had an elbow bend of several inches in them. He reinforced the struts by nesting the next size struts within the existing size streamlined tubing. In 1946 and 1947 at the Miami Air Manuevers, Edmondson placed second in the aerobatics competition to Bevo Howard in his Bucker Jungmeister, which is also in the NASM collection, but he won in 1948 when the first International Aerobatics Championships were held. Sponsored by Gulf Oil Corporation, he continued to use N36Y on the air-show circuit throughout the east and midwest until 1951. Edmondson sold the airplane to Johnny Foyle, an air show pilot of South Boston, Virginia, on August 22, 1960, who twice flipped the airplane over on landings. Foyle was killed in another airplane accident and John McCulloch, an Eastern Airlines captain from Naples, Florida, bought N36Y on June 18, 1965. McCulloch shipped it to Florida to be rebuilt by Monocoupe specialist C.V. Stewart and then test-flew the rebuilt airplane on March 8, 1966. McCulloch flew Little Butch throughout the late 1960s and early 1970s from his home in Virginia to airshows all across the eastern half of the U.S, and he frequently flew at the Flying Circus summer air shows in Bealeton, Virginia. McCulloch claims that he is the only owner who never put the airplane on its back. Wishing to preserve this historic and rare airplane, he asked Ken Hyde of Warrenton, Virginia, to restore the aircraft to Edmondson's red and white paint scheme. The airplane flew again in October 1974 and it was then lent to the Shannon Air Museum in Fredericksburg, Virginia. 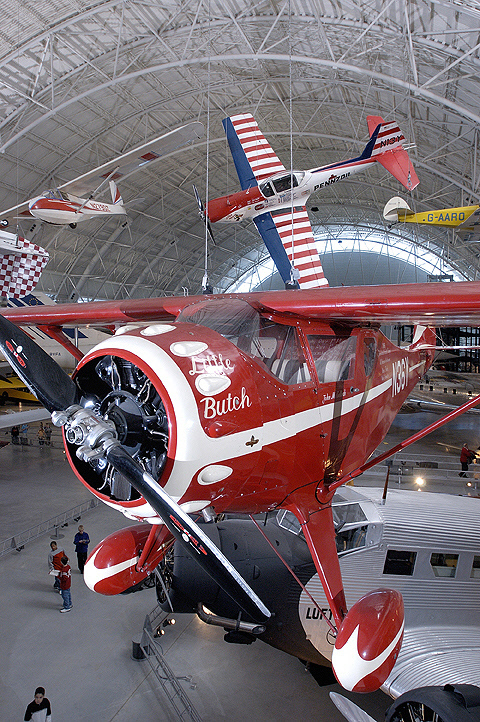 McCulloch donated Little Butch to NASM on December 29, 1981.